Juniors Kate McInerney and Lily Klinek, founders of Upper School Service Learning group Craft Care Kits, are on a mission to spread joy and curb boredom at Rady's Children's Hospital. Their idea, to "deliver activities" to young patients faced with long hospital stays, began as a 10th-Grade Planting A Seed Project. 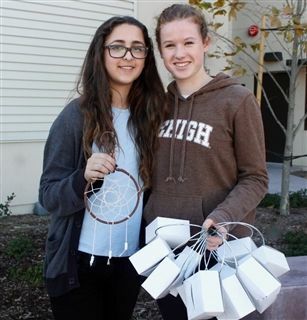 This year, Kate and Lily used the grant money they received to purchase enough supplies to assemble 300 dreamcatcher kits, and plan on sending 25 kits to Rady's each month for a year. "We decided on dreamcatchers because they are fun to make, and they can be used to decorate a room or door to make it more personal during a patient's stay," said Kate. "We hope the kits will make patients feel more comfortable, and help fill up at least a little of their idle time."